From the Cumberland Gap to the Atlantic Ocean, this is Virginia Water Radio for the week of January 13, 2014. This week, we drop in on the latest opening-day of a nearly 400-year-old Virginia institution. Have a listen for about 90 seconds. With those and other words, ceremonies, and procedures, the Virginia General Assembly opened its 2014 session on January 8. 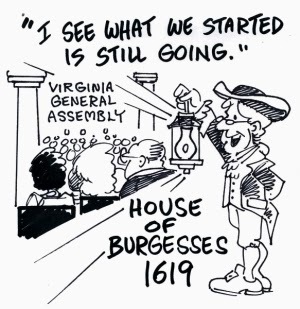 The Commonwealth’s legislature traces its history to the establishment in 1619 of the House of Burgesses in the English colony of Virginia. The modern Assembly’s two houses, the House of Delegates and the Senate, convene every January for either a 60-day scheduled session (in even years) or a 30-day scheduled session (in odd years). Every year, the Assembly deals with the state budget and considers two-to-three thousand bills and resolutions. That agenda typically includes 150 to 200 water-related bills, on topics ranging from marine resources to groundwater to local water and sewer systems. The sessions move fast and the decisions can have widespread and important consequences. You can follow the work online through virginiageneralassembly.gov, or by communicating with your delegate or state senator. Cartoon by George Wills, Blacksburg, Virginia. Click here to listen to a longer excerpt (9:43) of the opening of the 2014 Virginia House of Delegates, including members' oath of office and the election and full address of Speaker William J. Howell. The transcript of new Virginia Gov. Terry McAuliffe's first address to a joint session of the General Assembly on January 13, 2014, is available at this link: https://governor.virginia.gov/news/newsarticle?articleId=2572. Information on the Virginia General Assembly was taken from the Assembly’s Web site, http://virginiageneralassembly.gov/. That site includes information and links for following legislation (see note below) and for identifying and communicating with one’s representatives in the House of Delegates and Senate. The Virginia Legislative Information System, at http://leg1.state.va.us/, is the online location to following the legislation of General Assembly sessions.